Raw, powerful and intensely beautiful: these are some of the words that have been used to describe Rojkind Arquitectos’ Foro Boca Concert Hall in Mexico. These qualities come from the architect’s understanding and application of concrete for this project. And this earned the building the Concrete in Architecture Award in the World Architecture News Awards 2018, which were presented earlier this month in London. already planned and providing a link between beach, breakwater and city. The concert hall, therefore has become a driver of community change, with activity focused not only on the hall’s interior, but on its accompanying public plazas. The building reflects the breakwater’s protective concrete blocks, being comprised of a cluster of cube-like volumes. Exposed concrete walls have a board marked finish, set at different angles, accentuating the building’s form and play on perspective. Visitors enter the building beneath a cantilevered void, moving into a lobby lit by skylights and animated by suspended bridges and stairs. The interior of the building is as dramatic as its exterior, with its soaring voids and raw finishes. The building houses a 966-seat performance venue, with back-of-house functions, rehearsal rooms and other spaces. 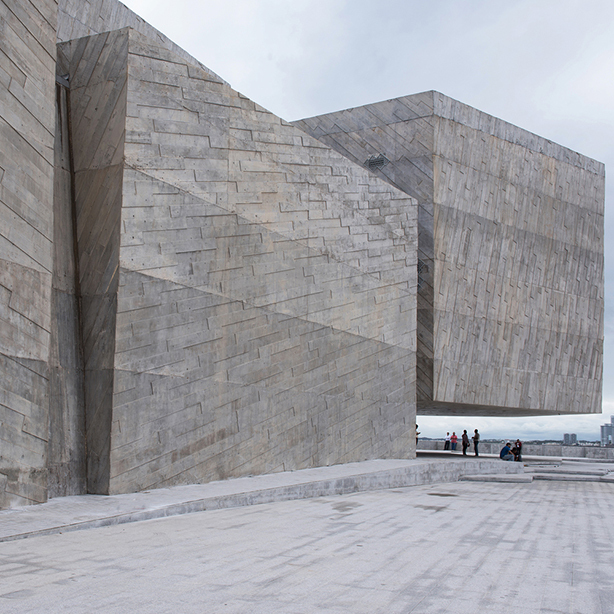 Foro Boca Concert Hall is among an international line-up of projects recognised in the WAN Awards 2018. The awards highlight excellence in current and future projects, as well as the application of new technologies and architecture’s rising stars. The full list of winners of the WAN Awards 2018 is here.